The food waste problem has always bothered me. Since I was a child. Throwing food in the garbage was not conceived -nor allowed- in our household: “Think of those poor starving children of Africa”, my mother would say. And I would have images of skinny bony legs and arms and protruding bellies haunting my thoughts. My father, on his part, if he cooked too much food, would eat leftovers for days until they were gone. Growing up, I continued to be very self conscious of the problem and I would shop daily for the strict necessity not to have to discard the too much food that would be in the fridge and never used. As a consequence, having an overloaded fridge, freezer and pantry is something I am not accustomed to. For me, too many groceries inevitably lead to waste. And I was shocked at knowing how much food gets wasted even before it reaches our homes. Fruits and vegetables that don’t meet the “esthetic canons” of the market (tomatoes that are too ripe, apples showing the scars of rubbing against a branch, bruised zucchini, ugly shaped potatoes and so on) they never get to a store. And I don’t even want to start a disquisition on the meat waste problem, that deeply touches my heart. We should appreciate the “naturally imperfect”, nonetheless we all want perfectly shaped, sized and packaged food to sit in our fridge/freezeer at our disposal. Sometimes for too long, and then it gets trown away. In order to avoid that, a meal planning and a more conscious eating is our answer. Our grocery shopping usually starts on a saturday morning when, after our customary breakfast outing, list in our hand, we head to the Farmers Market first and to finish it off to our local grocery store. Moreover we try, and I must say with success, to utilize everything we have leftover in the fridge before it gets wasted. This brings me to my today’s baking. I know I had ricotta and whipping cream that wouldn’t last forever, and the last of fresh B. C. raspberries we found last saturday at City Market Downtown. 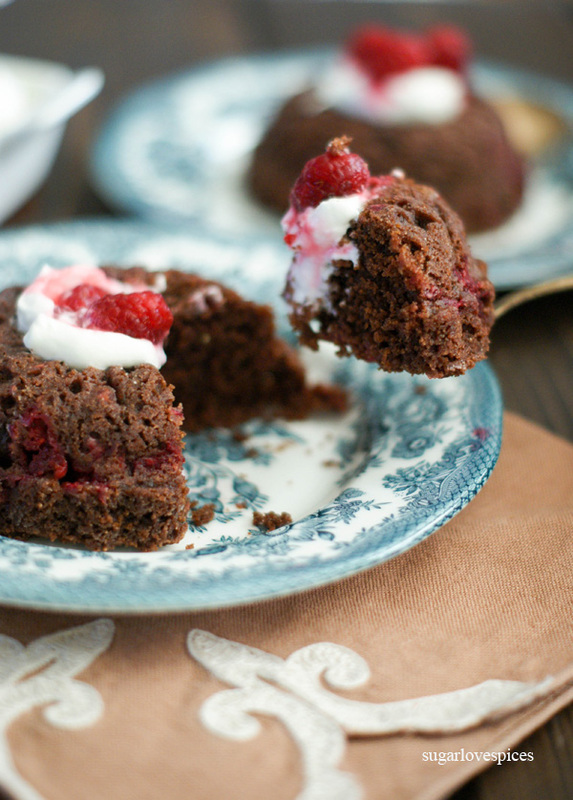 The idea of what to bake came almost immediate: Raspberry Cocoa Ricotta Mini Cakes. 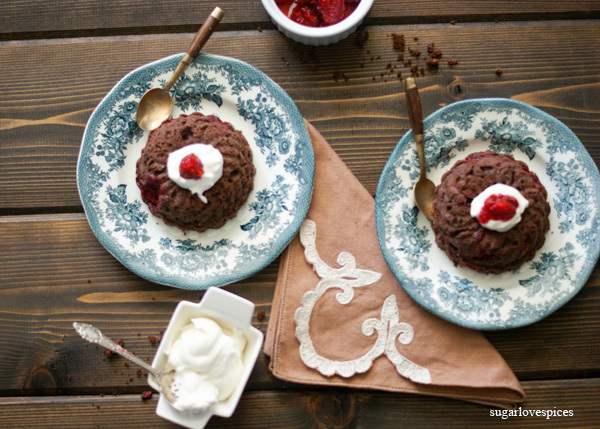 Raspberries and chocolate are a great combination, that sweet and tart blending everybody loves. 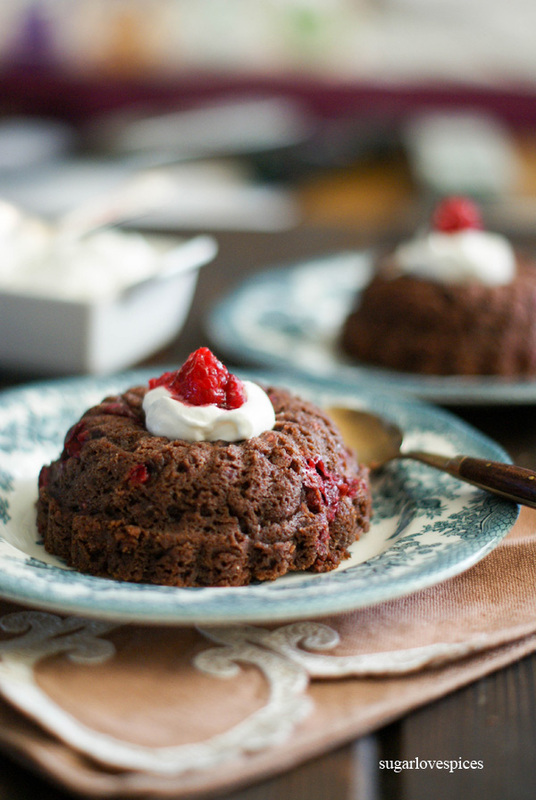 The addition of the ricotta and whipping cream in the batter just makes the mini cakes so moist and rich and delicious. The choice to bake mini cakes instead of a loaf or bundt cake is just because we like the idea of an individual size dessert but also having them for breakfast and they look so cute! You will need to bowls, one for the dry ingredients, one for the wet and 6 mini cake pans or a loaf/bundt pan. The batter is easy and fast to make and it is more on the thicker side. Just remember not to overwork it. You could add chocolate chips (chocolate chips and raspberries..mmm..) for a more luscious dessert, but I can say that they’re already pretty rich in flavor with the cocoa. They’re not too sweet, they’re soft with a little density, and a bit crumbly, well balanced in flavors and extremely adorable. For tonight’s dessert, Loreto whipped up the rest of the whipping cream and we nicely topped the mini cakes with a spoonful of it and few fresh raspberries. It was delicious! Tomorrow, breakfast will be ready, but we’ll skip on the whipping cream. Enjoy and let us all try not to waste food. 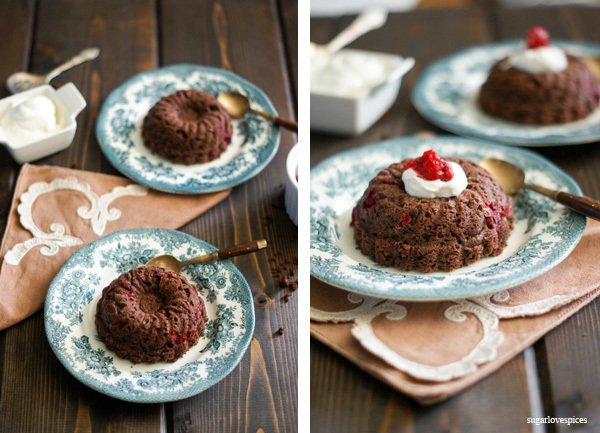 With these cocoa mini cakes, we did our little part, they’re all gone. 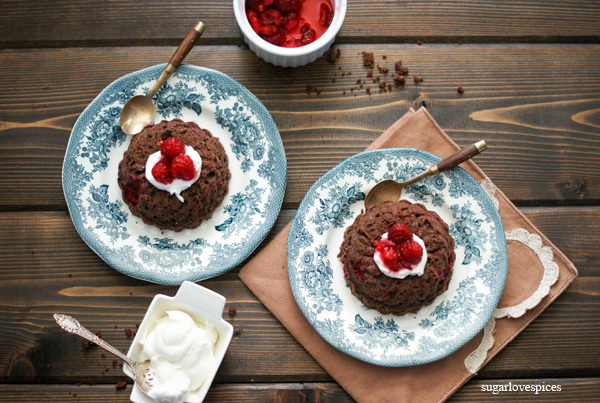 In a medium bowl, combine the dry ingredients: flours, cocoa powder, baking powder and salt. In a large bowl, whisk egg and sugar until they’re mixed together. Add oil, ricotta and milk and give another whisk. Pour the mixed dry ingredients into the wet ingredients and whisk again lightly. 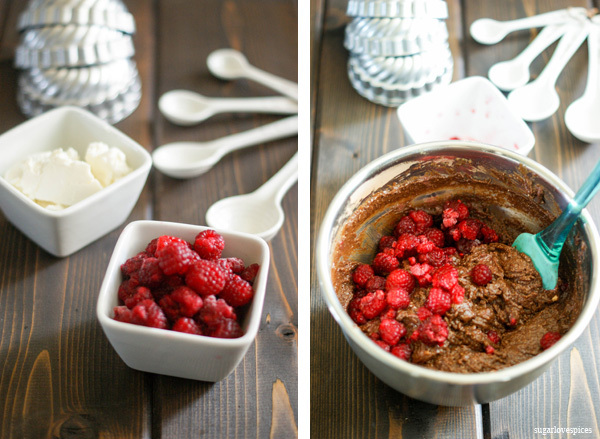 Finally, add the fresh or frozen raspberries and using a spatula, mix it lightly. Pour the cake batter in 6 round mini cakes pan and bake for about 40 minutes or until a tooth pick inserted in the center comes out clean. Cool on a rack for a few minutes, then fip the mini cakes over, arrange on a plate and decorate, if desired, with whipping cream and raspberries on top. In una ciotola media unite gli ingredienti secchi: farina, cacao, lievito e sale. In una ciotola grande lavorate le uova e lo zucchero fino a che sono bene amalgamati. Aggiungete olio, ricotta e panna (o latte) e mescolate senza lavorare troppo l’impasto. Aggiungete alla fine i lamponi mescolando delicatamente con una spatola. Versate l’impasto in 6 stampini per torta da 9 cm l’uno o in una tortiera singola. Cuocere in forno per circa 40 minuti o finché uno stuzzicadenti inserito non esce pulito. Lasciate raffreddare e guarnite con panna montata e lamponi. OMG! These are so cute and sound heavenly delicious! 🙂 Thanks for sharing. You’re welcome! Thank you for stopping by. Hope you’ll come back, we always have something delicious to share. Those cakes are beautiful and what you have to say about food waste is spot on. We all have to try to consume more wisely and reduce our impact. Thanks Teresa for taking the time to leave a comment. Maybe through our efftorts we can create a wave. Oh my, do I want these now Nicoletta! I love your idea of adding ricotta to the batter; yum!! I definitely aspire to be less wasteful with our food, and your lovely post is a nice reminder… many thanks!! Thanks Jackie! Since I’m not a fan of butter I often use ricotta, yogurt, mascarpone or whipping cream (whatever I have in the fridge) to moisten the batter. If everyone does a little bit we will at least put a dent to the food waste problem. They look beautiful Nicoletta. 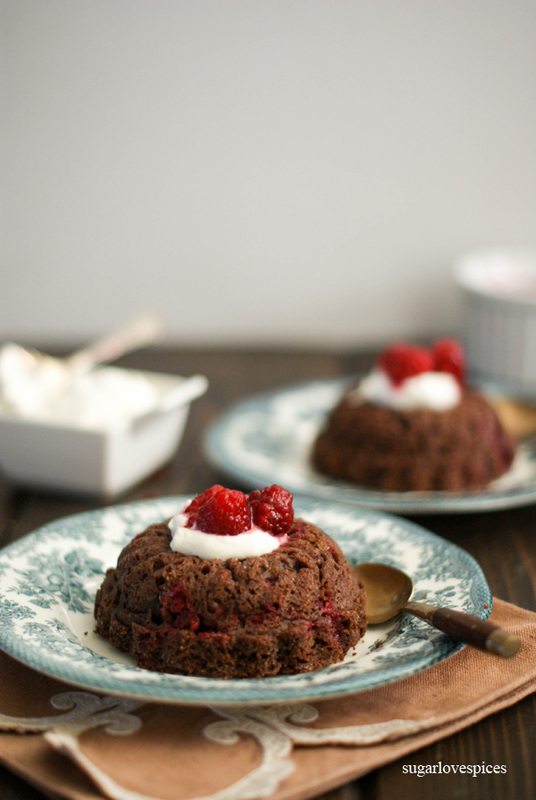 This gives me the perfect excuse to buy those mini bundt pans I’ve been eyeing up! Thanks Debs! I bought my mini cake pans at the antique mall, they are lovely. I would go with that excuse and get them 😉 .